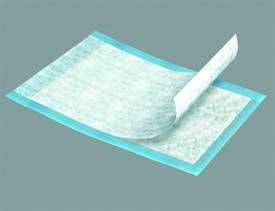 What are the major advantageous to using disposable bed pads over standard bed pads in clinical and emergency room settings? The most obvious advantage, which most staff will indicate is also the major advantage, is the easy of use of these disposable bed pads. They come pre-folded and easy to open up and slid under the patient or to be placed on the bed when the patient is up. Since they are pre folded and designed for easy opening they are never wrinkled and bunched like the reusable pads and the edges never start to fray or unravel, leading to ragged looking linens. 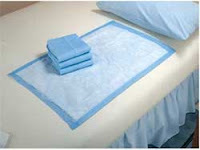 This also prevents leakage from the edges of the disposable bed pads when there is a lot of fluid within the pad. Of course the pads are also ideal for quick changes and disposal. The can be folded or rolled with the exterior polypropylene backing facing outward and simply placed in the trash. This limits the odor that can result from soiled or wet reusable pads sitting in a laundry bag in the patient's room waiting for the housekeeping staff. As they are designed for single use only, there is never any concern with contamination or the spread of bacteria due to incorrect laundering procedures or transfer from one patient's room to another. Patients as well as staff report that this is a major consideration as an advantage over the disposable bed pads when compared to traditional reusable options. How do disposable bed pads stay in place on the bed, don't they slip across the sheets and cause the patient discomfort as the patient moves in the bed? As with traditional reusable bed pads the disposable options have a backing that is designed to trap moisture in the pad and prevent leakage through to the bed linen as well as prevent the pad from slipping across the sheets with movement. With the disposable pads this backing is made of polypropylene which is highly tear resistant and also an excellent moisture barrier. The thinness of the pads also provides additional patient comfort even if they do shift slightly. This is very different than the thicker, bulkier reusable bed underpads that can twist and move to create a very uncomfortable surface for the patient. It is simple for staff to remove the disposable pads in comparison to the standard pads for the same reason. Since they do not bunch up under the patient, even with considerable movement, rolling the patient to one side is usually all that is required to remove the soiled pad and replace it with a clean, fresh disposable pad. How do disposable bed pads come packaged? The packaging of disposable bed pads depends on the manufacturer. Most come in bundles of 100 or more and, when priced per unit, they are literally just a few cents each. Since they cut down on the cost of laundry and the necessity for additional staff on a unit to handle patient bed changes and clean-up they are often very cost effective in all types of medical and long term care facilities.